In this topic I will share about modding and customizing your Sillent Hunter 3. Can I? My English is bad and my modding techniques are amateurish, so be careful. 8 - How the terrain texturing work. Last edited by Tycho; 11-13-2018 at 07:16 AM. Where you can download them? Recently, I decided to deepen in the types of terrains in the game. And here will share what I learned. I saw relationship between TerrainTypes.raw, Terrain.cfg and folders Terrain\Textures and Forests. First TerrainTypes.raw, it is pure data grayscale image, without any header, every byte define one shades of gray. Next is Terrain.cfg, there have a IDX converter, where different shades of gray are specify to 9 terrain types. This is original TerrainTypes.raw, I made it more brighter to see it. For example, I experimented a bit, and made a new one with more simple drawing, but with 11 terrain types. In the future, I always may edit it as I want. Will take me so much time to pick textures for all this. You may separate terrain type to different seasons, with different textures and different forest file. On the next day, 1st september, the textures will not changed to the autumn. The changes will happen on the next game loading, according to the in-game date of your save. Terrain.cfg is editable through notepad. 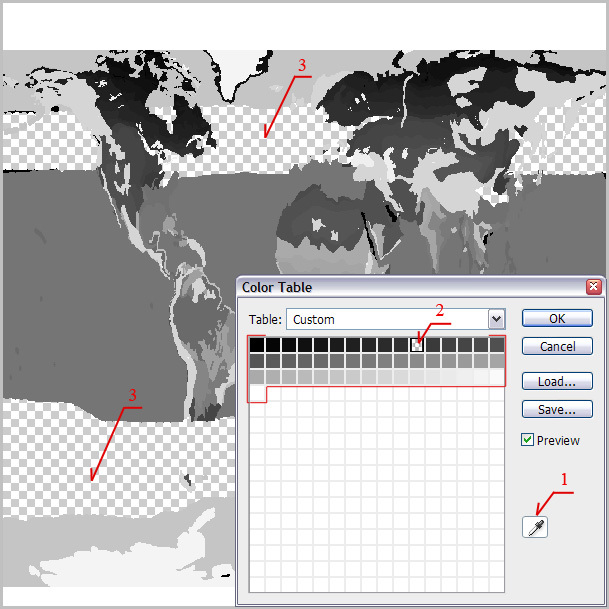 TerrainTypes.raw is editable through hex editor (very cumbersome), or with graphic editor. Probably Photoshop open and edit it, but I use PaintNet. 1 - Go on ImageMagick site and download, I prefer the portable version. 2 - Extract the archive somewhere on your computer, in my case: "D:\Programs\ImageMagick\"
Change the path to the convert.exe, according to your. Now, when you start the "RawToTga.bat" file, ImageMagick\convert.exe will convert it and create a new file "TerrainTypes.tga". When you start the "TgaToRaw.bat" file, ImageMagick\convert.exe will convert TerrainTypes.tga and create a new file "TerrainTypes.raw". So now you are able to experiment with terrain texture drawing in the game. You want Saint Helena island to be with the specific textures, no problem. Let me check my Russian! Не имеется ничего для скачивания. Я говорю люди, как они могут редактировать свою игру. Nothing for download. I write how someone can edit its own game. Last edited by Tycho; 05-03-2017 at 03:54 AM. In TerrainTypes.raw, are they 9 or 32 different shades of gray ? You can only open this file after having converted it ? What is a batch file ? How do you create it ? They are 32. Under [IdxConversion] you specify for every index what terrain type will be. Means, that all first three indexes for the game they will be TerrainType=0, index 13 will be TerrainType=2. Probably Photoshop open and edit it, but I use PaintNet. So I first need to convert it. For conversion I use ImageMagick. You can use any text editor (such as Notepad or WordPad) to create your batch files. As long as the file extension ends with .bat it will be a batch file. To run the batch file, double-click it like any other program. Once the batch file has completed running it closes automatically. Thank you very much for explanations. I will try this. Why have you made this ? Would it be possible to add new foests types ? Are the sea types controlled in the same way ? With a .raw file ? Just for experimentation. I tried quickly to make more types of terrains and seasons. For example, when in north tropical zone is wet season, in the south tropical zone is dry season, and vice versa. Would it be possible to add new forests types. Yes, but is lots of work. Yes. But according to some old posts in the forum, I remember, that I've read that something not work correctly there. When the time comes, I will dig there, but for now I don't know. Thank you for your wonderful Russian! But why do not you upload your mod to download? Not all have to work with Photoshop and similar programs skills. Tycho: Is it possible to create a whole new world/map for SH3 like this? I mean, is it possible to use for example a mercator projection map to create a new world for SH3 with it? But why do not you upload your mod to download? Not all have to work with Photoshop and similar programs skills. Because there is no mod. I just some days ago start just a quick experimentation with this. Now I need to do more precise TerrainTypes.raw, and I'll need many and varied textures, that I'll search and choose to my flavor. But, because right now this is not my main activity on SH3, will take me a months until I'll come to that. All that above with TerrainTypes.raw and Terrain.cfg refers to how the game define where and when on the world, what textures to use for terrain drawing. Hi, to lover of retro. For starters, I think, you should find and look at old threads where answers on your questions are (may be). At the beginning of 2006 year's ref, distinguished modder, published their work - Terrain Editor for SH3. I advise you to carefully read this topic and all subsequent, related, in SH3 and SH4 Workshops... where ref explains many things. ... and you can working with image... and so on. Last edited by Anvart; 04-30-2018 at 07:04 AM. Îòðûâîê èç ñîâåòñêîé ïåñíè: "... àäðåñîâàííàÿ äðóãó õîäèò ïåñåíêà ïî êðóãó ..."
Ops, sorry. Change browser encoding, and now I see it. Last edited by Tycho; 04-23-2016 at 07:13 AM.